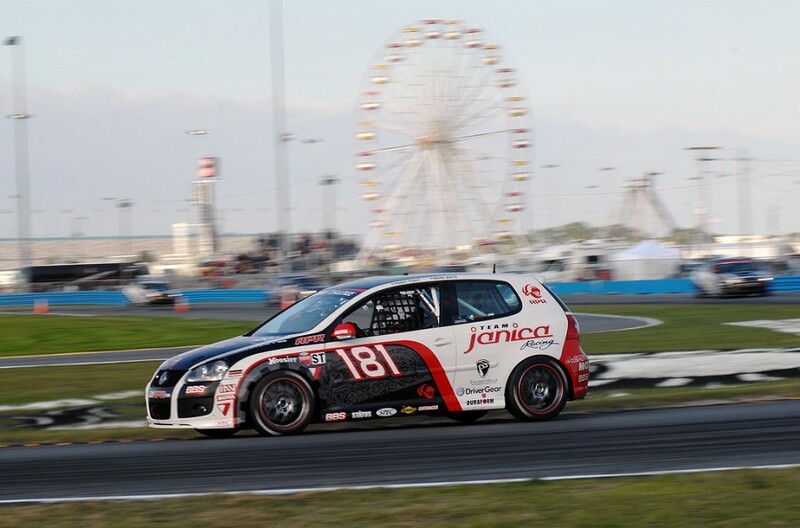 Daytona Beach, FL - APR Motorsport started the 2008 Koni Challenge ST series with success, seeing all three VW GTi race cars finish the first race without a single mechanical issue, finishing 21st, 23rd and 41st in class. The #191APR Motorsport VW GTI driven by Ed Zabinski and Scott Tucker was running 9th overall until the second to last lap, when it ran out of fuel on circuit with Zabinski behind the wheel. Ed detailed the situation, saying, "We were so close! We had the choice of trying a splash-and-go and losing a significant amount of positions or pulling out the old horse shoe and hoping we had enough fuel to carry us those last laps. Unfortunately, luck just wasn't on our side and we ran out of fuel on the high banks with only two laps to go. It was my call and I stand by it. We really didn't fall too much further back by taking the chance versus going for the splash-and-go. I want to thank my team for the great effort and for giving us such a great car." The highest finishing APR Motorsport GTi was commanded by Randy Pobst and Mark White, despite their #181 car suffering two major racing incidents. The first was early in the race, when while White was piloting the wheel, the car was struck by a GS Class Mustang in both the rear and right side, causing considerable damage. Later in the race, another GS Class Mustang ran into Pobst at turn 1 under braking, heavily damaging the driver door. The #181 car returned to the garage post race with neither side mirror attached, a completely crushed rear tow hook and looking battle tested. Despite all the contact, the #181 still managed a 21st place class finish. White said, "I really enjoyed my first race in Koni ST. The competition was very strong out there. Unfortunately, we just had nothing for a handful of cars. I look forward to getting back in the action at the next race, as I'm confident if we hadn't suffered from so much contact we would have been much further up in the field." Pobst furthered White's sentiments by adding, "Many of the cars in our class simply had more horsepower than we did and it was tough to compete, but the team gave us fantastic cars that just ran and ran. Like everything APR does, the crew and car performed perfectly. Considering some of the aggressive driving we experienced and our being a bit down on horsepower compared to the competition, I am pretty happy with the results, actually. I look forward to driving the ever improving GTi's at Lime Rock in May." The #171 Ian Baas/Dion von Moltke car finished 41st in class and was actually the victim of the most damage of the day, but still finished the race after some time back in the garage area getting a ball joint replaced, finishing 41st in class. Early in the race, just before the first driver change, von Moltke was struck on the drivers side of the car just at the entrance of corner three, damaging the ball joint badly and requiring the car to be taken behind the wall for repairs. Dion said "It's really too bad. The car was really, really good and I was making steady progress. I out-braked a BMW and was under him on driver's right and apparently he didn't see me. Just as we turned in, 'boom', he made contact. I knew immediately something was up, as the alignment was way off. Thankfully the car was able to be fixed with relative speed and Ian was able to get back out there and make a run." Ian Baas said, "Even with the car being a bit less than optimum, our GTi ran really well and I was able to make steady gains as the race progressed. Had the car not been damaged early on, we'd likely have been able to finish in the top 20 or so, which I'd say is pretty good considering this was the car's first race and there are just so many fast cars out there. I look forward to Lime Rock which will likely suit our cars better."